Barry Collins - Any Old Photos of Coal Wagons From Cadeby or Barnborough? Janet Kitson Roberts - Who Owns The Bentley Mining Disaster Monument Of 1931 In Arksey Cemetery? Kath Jones - When Was This Photo Taken? 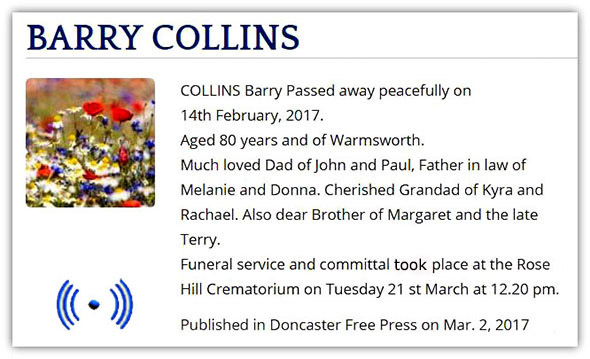 Rail Wagons Above The Humber Sloop "Phyllis"
I am very sorry to have to inform you all that my father ‘Barry Collins’ passed away, 14 Feb 2017, whilst in hospital at Doncaster Royal Infirmary. He was recovering from a fall he had, they were treating him for heart failure and he seemed to be on the mend although very weak. From what I understand he passed not long after they had put him to bed. The funeral service took place on Tuesday 21st March at Rose Hill Crematorium, Cantley, Doncaster, followed by a wake at Cantley Lodge. Any Old Photos of Coal Wagons From Cadeby or Barnborough? I have attached a photo of something I had not seen for some thirty odd years. (not since I used to hang on to the crossing gates at Arksey and watch the trains go by). I am now engaged in putting together a model coal train with a wagon bearing the name of each pit in the Yorkshire coalfield. I am particularly interested in Cadeby and Barnborough if anyone has any old photos. Meanwhile I am ploughing through books and records; I'm hoping to go to the Mining Museum at Wakefield next week to see their archives. I've just been Googling this subject to help my mother, Lilian Jones, find out if someone has written a book about being a nurse at the time of the pit disaster. My husband mentioned that he had heard about it on the radio, but can't remember the details, and I found your website. It seems there were two pit disasters at Bentley; one in 1931, and one in 1978. The one my mother remembers is the one in 1931. She would have been 6 at the time. Her father, William Brown, was Night Overman, and he gave an account of the rescue which differs from the report in the Mines Department. My mother has written a book about her family which includes this account, and I'm wondering if this would be of interest to your other correspondents (?). Mum is 90 now, which is why I'm the one sending her message, but I'm using her laptop, so you can see that she is still quite in touch with the modern world! Back in 2012 Caren Fox emailed me asking for information for a lady, Joan who was a nurse at bentley, she was trying to finish a book but she had Alzheimers. There is also a book on Amazon:- At the Coalface: The memoir of a pit nurse Paperback – 16 Jul 2015 so too late for the Bentley accident. 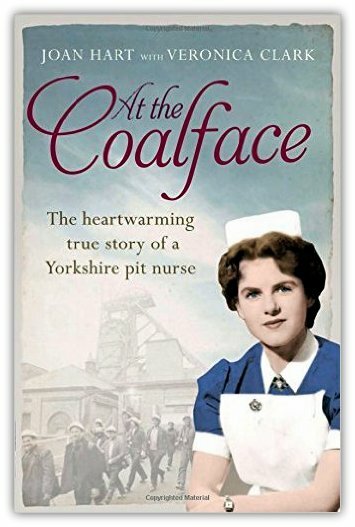 This is the memoir of Joan, who started nursing in the 1940s and whose experiences took her into the Yorkshire mining pits and through the tumult of the 1984-85 miners’ strike. I am a member of a writers club, and trying to help a lady who is writing her life story of the time she worked as a pit nurse. One part she is struggling with is the Bentley Pit Disaster in 1978. She originally worked for Hatfield Pit but was called to help out at Bentley when the incident occurred. I noticed on your website a few people who either witnessed the ordeal or a member of their family did. I wonder if you could put me in touch with them so I can ask if they will help my friend with further information for her book. Your website is most interesting with respect of knowing and working with the persons mentioned. If I can be of assistance please provide my e mail address to anyone looking for more information. My name is Brian Marshall, I went into the mining industry in 1956 from leaving school, and I took voluntary redundancy in 1988. Re CAREN FOX letter dated 21st October 2012 looking for information for a former nurse employed in the mining industry, I still have my reports from the accident at Bentley Colliery on Tuesday the 21st of November 1978. At that time I was the Senior Assistant Superintendent at Doncaster Mines rescue Station, I received the call for assistance at 05.13 hours and assisted the Nurse in question along with Dr Ewan McGregor the Area Medical Officer. Sean Box, Family of one of the deceased, Donald Box also asked some questions, Don was a member of the Doncaster Mines Rescue Station part time Brigade, there was a Trophy dedicated to him named "The Don Box Trophy" This Trophy was presented Annually to the winning Rescue Brigade from the Miners that trained at Doncaster Mines Rescue Station. If I can be of further assistance please contact me, I will be happy to assist. 1956 to 1967 General Mining - Coal Face P.L.O. - Deputy - Shotfirer. 1967 to 1973 Ashby Mines Rescue Station Perm Corps - Instructor. 1973 to 1978 Station Officer Hednesford Mines Rescue Station. 1978 to 1982 Assistant Superintendent Doncaster Mines Rescue Station. 1982 to 1986 Superintendent New Heriot-Watt Mines Rescue Station. 1986 to 1988 Superintendent Ashby Mines Rescue Station. 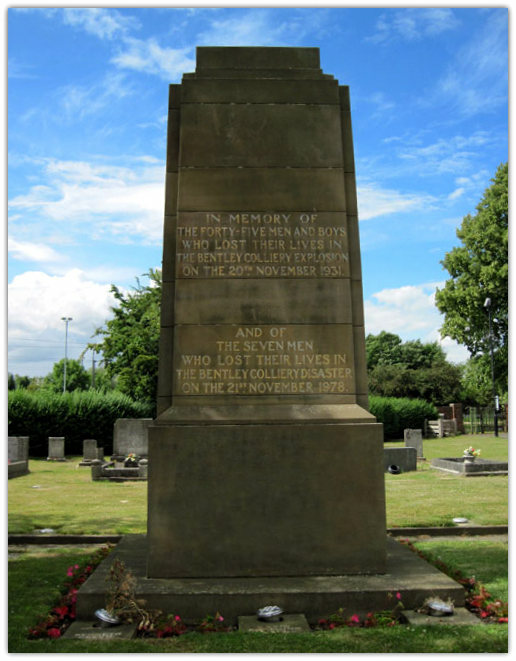 Who Owns The Bentley Mining Disaster Monument Of 1931 In Arksey Cemetery? Do you or anyone else know who actually owns or bought the monument to the people who died in the Pit Disaster of 1931 at Bentley Colliery which is in Arksey Cemetery? 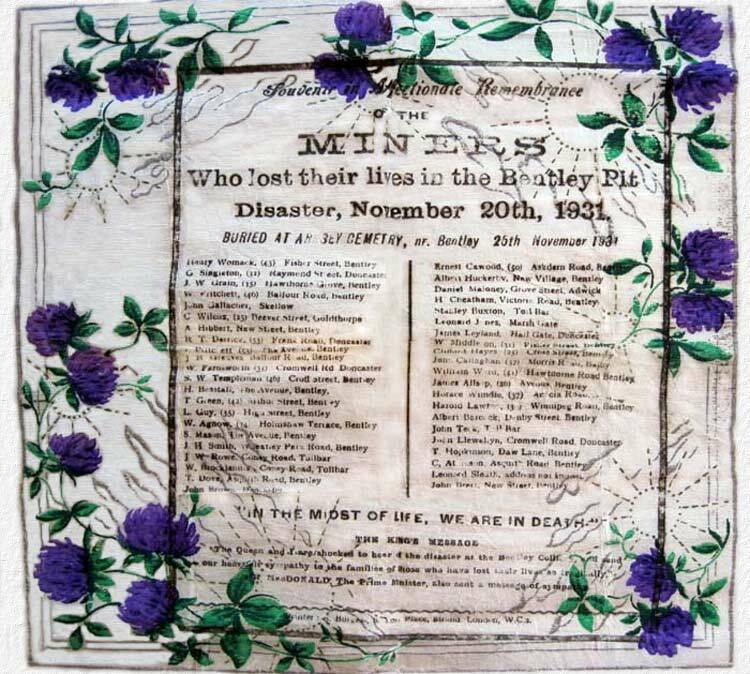 When there was another smaller pit disaster at Bentley Colliery some more names were added to the monument, so who or what organisation paid for them to be added as it may indicate who owns it? I have enquired at Rose Hill Office, Doncaster and they only say that they are responsible for the monument and grave spaces. If I visit Arksey Cemetery where my parents, son and brother are buried ( I do not live in Doncaster), I will photograph the monument and send a copy to you. You can access events of the last few years in the Free Press on-line which is very useful. The rest you have to go to Waterdale Library in Doncaster for & use microfilm which is old fashioned!! Thank you for adding my e-mail to your site. I have had another reply from Rose Hill. They say The Mining Disaster Monument of 1931 (& 1978) at Arksey Cemetery was purchased by the Miners Welfare from donations at the time of the disaster and is therefore their property but it is on the council's land. Due to the collapse of the pits, the responsibility has been taken on by DMBC. Bentley Library have a book on the 2 disasters. I was at a friend’s yesterday. She let me photograph this souvenir of the disaster. It is a bit crinkled - about the size of a serviette on crepe-type paper. My father was badly injured and sustained a severe facial injury in the November disaster at Bentley Pit in 1931. He had worked in the mines from being 14 years old, against his father’s wishes, due to the lack of money in the family. Father disobeyed him and they both worked in the Derbyshire mines, then in various mines around Rotherham settling in Askern around 1927, then working at Bentley until the disaster. He was a deputy by then and a first aid man. His two sisters married miners, one became deputy manager of Bentley in the 50s. Father received compensation of £70 the consultant in 1984 claimed that based on the severity of the injuries he would support a modern day claim but the mine had been privately owned, at the time of the disaster it was the property of Messrs. Barber, Walker and Company Limited. The consultant, an ears nose and throat consultant, after taking x-rays, found it hard to believe that such delicate work to restore my father’s face had actually been performed in Doncaster Royal Infirmary in the 1930s. Once out of hospital he was only able to get casual work until 1940 when he found full time employment working as a plate layer on the railways were he stayed for 25 years. The accident left him with epileptic fits. He was 31 at the time of the accident and lived in Askern near Doncaster his name was James Redvers Askey. I never heard my father complain or regret, he made the best of what ever came along. Mother never gave in either, they married in August 1929 my sister was born in May 1930. The £70 bought them a gypsy caravan which they put on my grandfathers land. Their stroke of luck came when father applied for work on the railway and was accepted. I have known him have a fit during the night and still be off to work at 5 in the morning (he never had a fit at work). In 1960 they built a bungalow. I admire them both but for me my hero has to be James Redvers Askey born 1900. When Was This Photo Taken? Rail Wagons Above The Humber Sloop "Phyllis"
Hello, I came across the picture of the miniature rail wagon that Barry Collins sent in. I thought it may be of interest to him or some other followers of your site to see the attached pictures. 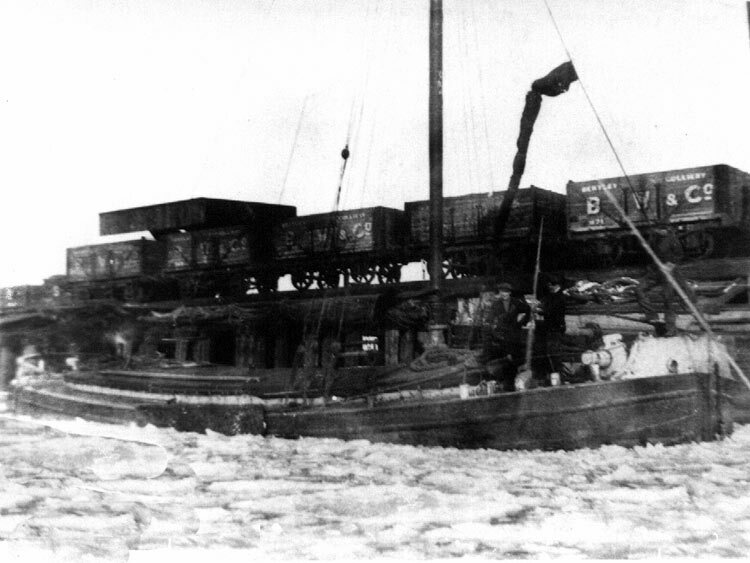 I assume that the black and white picture is of the loading staithe on the River Don, the Humber sloop loaded with the crew breaking ice is "Phyllis" built in 1907 her skipper was Harold Harness. The rail wagons can be seen above the ship. Could someone tell me the approximate year (I think late 1940's) and also where exactly on the Don was the staithe? The colour picture is "Phyllis" today; We found her in Scotland and now own her and have restored her back to sail over the last 10 years. We would like to bring her back to the Don as a sort of pilgrimage to the Mine and the work she did. This is a complete longshot, but couldn't help but try! I work for The Sheffield College based on Granville Road, and we've come across a photo of a steam train in the 1960s passing by the building (The Farm) on site we currently stand on. We'd like to use this photo on an information board in our grounds, so would like to find out if we could gain permission. We have so far tracked it's origins to a book published in 1990 by a local company called Platform 5. They have informed us it was taken by someone called Barry Collins, but they don't have a record for him as it was pre-mass technology. I have searched for Mr Collins using a variety of possible other key phrases on Google, and have twice come across by emails sent and featured on your website by a Mr Barry Collins - the majority of other results lead to websites based in Australia. As this Mr Collins is apparently based in South Yorkshire, and has posted about the coal mining carts, I was wondering if it could be the Mr Collins we're searching for! So would it be possible, if you still have his contact details/email address to please pass on this email to the gentleman who has been in touch with your site, on the off-chance it is the correct Mr Collins?